After customizing the Mac OS X login screen using Visage Login or the Visage preference pane, many users want to take a picture to share with friends or post online. Here’s how to take a picture of the login screen in Mac OS 10.5 Leopard and Mac OS 10.6 Snow Leopard. Set up your custom login screen using Visage Login. Download the screenshot.sh script and save it to your Desktop. At the password prompt in the Terminal window, enter the admin password for your account and hit return. The Terminal will not display your password as you type. That’s ok… just type your password correctly and hit return. Select “Log Out” from the Apple menu and log out of your computer within 60 seconds. The Terminal app will ask you if you are sure you want to close the window. Click the “Close” button to quit the Terminal app and continue to log out. If you have your volume turned up, you should hear the shutter sound when the screenshot is taken 60 seconds after you ran the script. Log back in, and the login.png screenshot will be on your Desktop. + Tested with Mac OS 10.6 Snow Leopard. + No longer shows Mac OS 10.6 users a warning that Mac OS 10.4 or 10.5 is needed. Visage Login allows you to easily and safely customize your Mac OS X login screen. Visage Login keeps track of Apple’s default settings for every customization, so you can easily switch back to the original settings at any time. Check out the amazing screenshots! Visage Login requires Mac OS 10.4 or newer. If you are using an older version of Mac OS X, you can download the appropriate version of the Visage System Preferences pane instead. The price for all this path tracking awesomeness? Less than a buck. Version 1.2.1 fixes an issue that prevented a small number of users from setting their login screen background image. Visage Login requires Mac OS 10.4+. If you are using an older version of Mac OS X, you can download the appropriate version of the Visage System Preferences pane instead. Visage Login now lets you change the host information displayed on the login window. The host information can display the current date and time, Directory Services status (network accounts), IP address, system version, host name, and more. WindowFinder is now compatible with Mac OS 10.5 Leopard. WindowFinder lets you instantly access any open window from your menubar. Select a window from the menu and it will become the frontmost window. WindowFinder is easier and faster than Exposé, which leaves you mousing over dozens of miniaturized windows that all look alike. PowerController, the iTunes alarm clock, is now compatible with Mac OS 10.5 Leopard. PowerController is an iTunes alarm clock that is simple to use and packed with amazing features. PowerController wakes your computer from sleep and plays any iTunes playlist while fading in the volume. Visage Login and the Visage System Preferences pane are now compatible with Mac OS 10.5 Leopard. 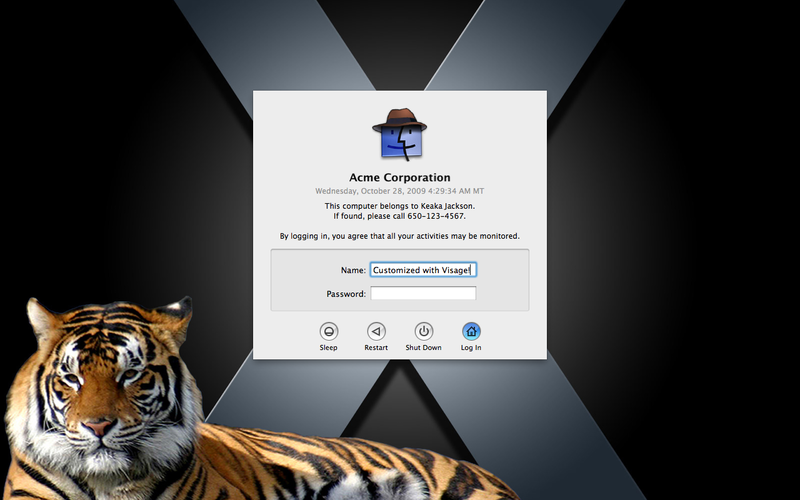 The login background feature now works in Leopard, so you can add a custom background image to your login window. Registration now works on Intel Macs with Leopard, and your serial number from previous versions is still valid. Visage Login allows you to easily and safely customize your Mac OS X login screen. Visage Login keeps track of Apple’s default settings for every customization, so you can easily switch back to the original settings at any time. You can add custom images to the login window, add a text message, or add an Acceptable Use Policy. The Visage System Preferences pane has all the features of Visage Login, and it offers even more customization options such as the ability to run screen savers as your desktop background and personalize system alerts. PowerController automatically recognizes when you change your time zone in System Preferences and reschedules your alarms. You no longer need to log out and log back in after changing your time zone. This update is ONLY for OS 10.4 (Tiger). If you are using another version of OS X, please download the appropriate version of PowerController from http://keakaj.com/powercontroller.htm. Set a different wake time and playlist for every day of the week! PowerController can also be used to schedule times for your computer to go to sleep or wake up (with or without an iTunes alarm).